I made a launcher for Knytt Stories. Each button does what it says it does, as long as your folder looks a bit like this. It's based on the source to a binding of isaac launcher, which I've used several times to make launchers for other things. 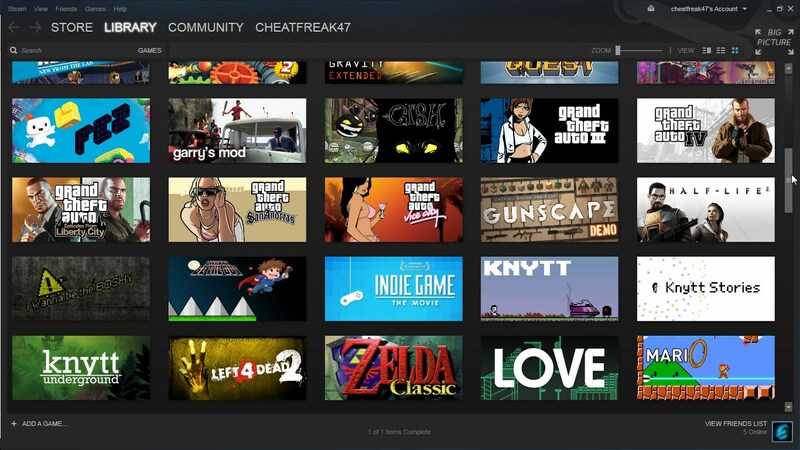 I made this because I put all my games in steam, so I needed one executable which allows me to start everything, then I went overboard with it a bit. I might take suggestions for things to add to it, so let me know if there's anything you think I should add in that I missed. Note that I can always tweak the ui to fit more stuff, so don't hold back on suggestions. I'm not gonna use this, but anyway because it's an awesome concept. 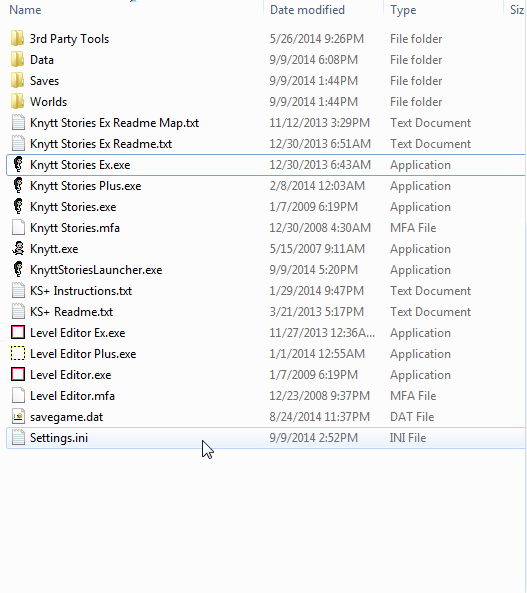 Also, small question: Why do you have Knytt in that folder in the image? No real reason, I just dropped it in the same folder as knytt stories when I downloaded it and added it to my steam library. Forgot about it when took the screenshot I guess. As in said in the op, I made this so I could launch any knytt stories exe without cluttering my steam library with multiple exes. Theres probably a couple other uses, like if someone wanted to make a knytt stories flash drive with autoplay, it might be nice. I really just posted it because I like to share anything software related that I do. Just one thing: Can you make it that the Launcher doesn't crash when you click on a button whose target doesn't exist? 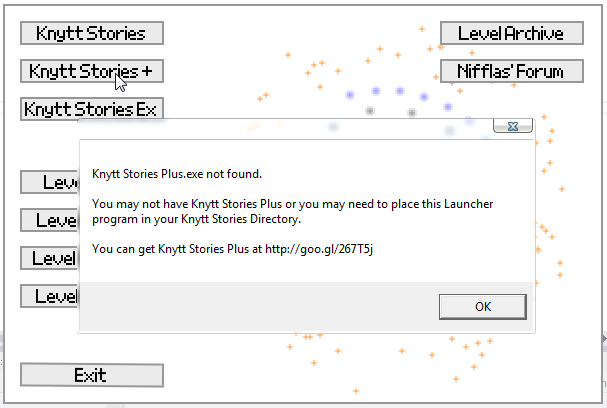 (For example: If I don't have KS+ and I click on it on the Launcher, it should give an error, like: "Knytt Stories Plus cannot be found", instead of crashing. 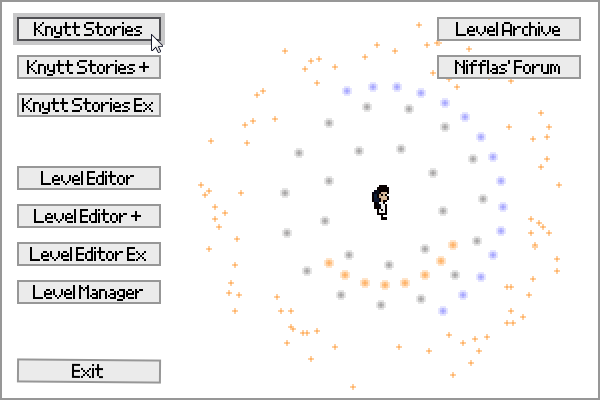 I could write a handler for that, but it'd be easier to just make a version without the KS+ buttons. Or even easier for you to get KS+. I'll upload a build without certain buttons if you tell me which ones to remove. That goes out to anyone, btw, just ask and I'll do it. In the meantime I guess I'll write a handle for missing files, been needing to do that anyway. Updated: Added an exception handler for missing executables. Clicking OK simply closes the dialog for the user to click on something else.